Indeed, we are really in the season of MTN Awoof. Last month, I shared with you How to Make Free MTN To MTN Calls For 24hours With Just N40 or 7days with Just N200. For months now, MTN is Smashing his customers with whooping and surprised Offer, to make Free Call for days and weeks, with just token. 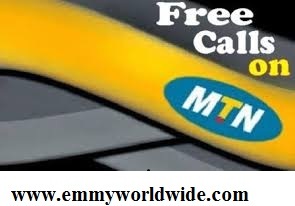 Today, I want to unveil to you, all the latest codes to activate free calls on your MTN line (any tarrif). Join me to enjoy while it last. 50 naira will be deducted and you will be given free call for 1week, you will be given 9 minutes everyday till the end of that week. 75 naira will be deducted and you will be given free call for 1week, you will be given 15 minutes everyday till the end of that week. 100 naira will be deducted and you will be given free call for 1week, you will be given 39 minutes everyday till the end of that week. Do you like this and is it working for you? If Yes, kindly drop me a comment through the comment box and if you are facing any problem with the setup, let me know and kindly share this post with your friends and tell your friends to share it with their friends. Related Posts: Free Call Tips, How to, MTN Tips. Labels: Free Call Tips, How to, MTN Tips.